It’s an idea that’s currently in the works, and has been tested in Europe, Australia and the United States. Perhaps sooner rather than later, seeing driverless trucks on the road will become something of the norm. What Exactly Does Driverless Semi Mean? So what does “driverless” semi actually mean? That there’s no need for a driver to be behind the wheel in these new trucks? Not exactly. While it does mean that in certain situations these trucks will drive themselves, it doesn’t mean there won’t be a human behind the wheel. The idea that in the future there might not be any opportunity for drivers to find jobs is just not true. This development could turn out to be really beneficial for trucking in terms of fuel efficiency, safety, and the good of drivers. These driverless semis are not completely autonomous, meaning that they don’t do everything on their own. In fact, the only times these kinds of trucks will take over are when they’re on the highway. Drivers will still need to plan routes, and be ready to take over in a moment's notice in case the computer system can’t handle a certain situation. 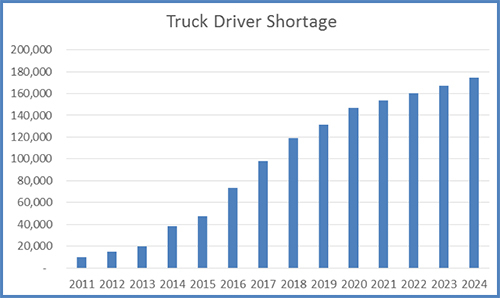 Truck driving jobs are not going away anytime soon. There are certain things and split-second decisions that only humans can make in terms of driving safely on the road. If anything, the driverless truck will make the job a little bit less stressful, and more attractive, to current and potential drivers. It’s a serious issue, and one that’s only expected to worsen in the next few years. Continuous advancement in technology to make the lifestyle of a truck driver a little bit easier and more convenient will only help the industry fix the problem. You can head on over to our post that breaks down the shortage in greater detail here. So what's your opinion on the driverless semi? In what ways do you think it will help or hurt the industry? We'd love to hear your thoughts!